Can You Pass this Ecology Quiz? 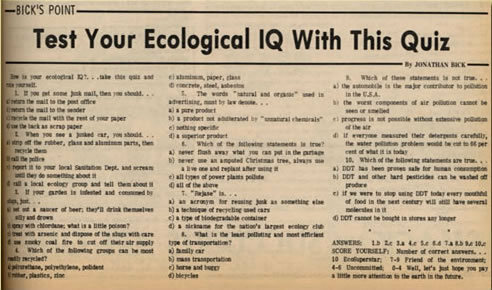 This quiz to test "your ecological IQ" was published in the Brown and White on September 29, 1972. The reporter, Jonathan Bick, Lehigh class of '75, had a sporadic column in the Brown and White from 1971-1972 called Bick's Point, dealing with environmental and social topics. In a 1971 column, he suggested a "pollution test kit" for 8-14 year olds as a way of training junior ecologists to report pollution results to government officials in order to improve the environment. In another, he encouraged students to "make 1972 a time of reappraisal and overhauling" for many social and political issues. He was the science writer for the Brown and White from 1973 to 1975.